The first Deception Dollars were printed in the autumn of 2002. They were a collaborative effort to overcome censorship of the basic facts about 9/11 that were so well concealed by the mainstream media, and to drive people to check out websites challenging the official story. Their popularity inspired many people to create better websites, as millions of Deception Dollars were passed out at anti-war rallies and marches in an attempt to prevent the unjustifiable, immoral, heartbreaking, war upon Iraq. Canadian artist Blaine Machan did the artwork, maintained the Deception Dollar website, and contributed greatly to the budding 9/11 Truth Movement. 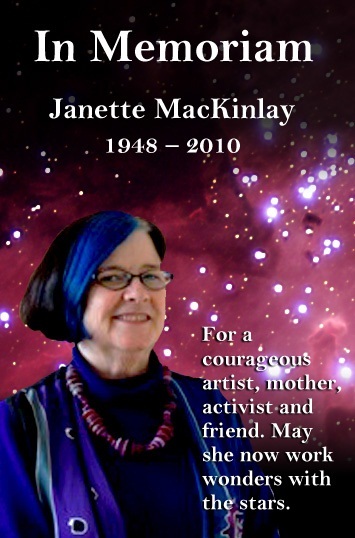 Let us remember Janette and think of her especially on her birthday, which is on Saturday, February 26th, by synchronicity a day in 2011 which might go down in history as “the day Americans woke up,” following the example of numerous other countries, rallies and demonstrations have been called for throughout the US to challenge the policies which enrich the few and impoverish the many. We will gather together the following day, on Sunday, February 27, 2011 to celebrate Janette’s life-- some of us in New York, and some in California--to share mementos, memories, food, drink, and stories about our dear friend, her life, her wake up call, which merits our attention, love, and appreciation. The following YouTube clips (of my 9/11 question[s] presented by Romeo Cantu of KGBT Action 4 News in Harlingen, TX) are of the District 15 and 28 congressional candidate debates that were held in Edinburg, TX, at The University of Texas-Pan American (UTPA) Student Union Building in October right before the November 2006 elections. Two of the video clips are from the PBS televised debate; the other is from my personal interviews of two of the congressional candidates, Paul Haring and Eddie Zamora. The audio link is of my interview of congressional candidate Ron Avery. The District 15 contenders were Ruben Hinojosa, Paul Haring, and Eddie Zamora. The District 28 contenders were Henry Cuellar, Frank Enriquez, and Ron Avery. Ruben Hinojosa won the congressional seat for District 15 and Henry Cuellar won for District 28.